It's been 25 years since my lifetime's most public moment, a four-minute civilian guest spot on The Tonight Show with Johnny Carson. I am taking occasion of this silver anniversary to gather memorabilia and publish a full account of the TV appearance and all that surrounds it. There is a lot of ground to cover, so I'm breaking this into a three-part series. Part 1 discusses my alphabetizing talent itself and events leading up to the TV spot. Part 2 will follow on the broadcast's anniversary date, Nov. 22, and will give my behind-the-scenes account of that particular day. Part 3 will cover the aftermath: publicity, events, and what I learned from being on TV. How Do You Doooo That?! It was so easy for me that I could do it in a split second, even for several words in a sentence. I alphabetize each word separately, not the entire sentence. 1) When a letter is repeated in an English word, should it be repeated in the alphabetized word? I decided that it should. 2) How should alphabetized words be pronounced? 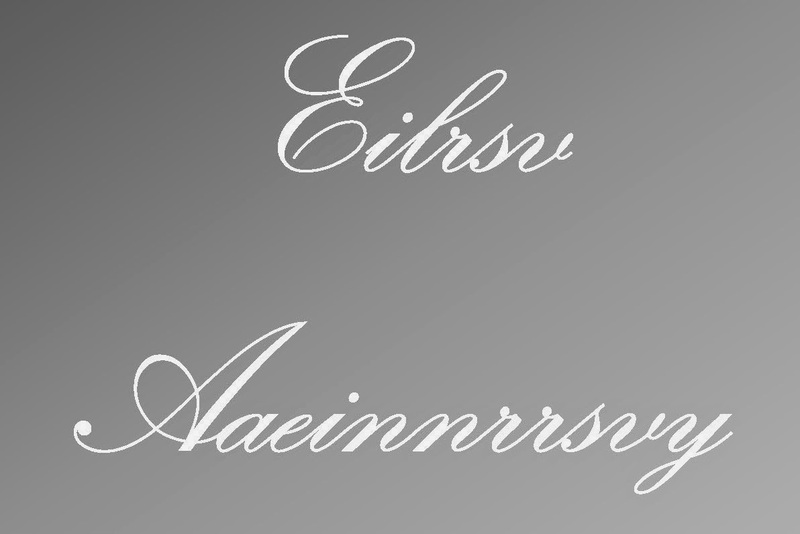 Certain letter combinations become very common when alphabetized, and I have pronunciation conventions for them. For example, I pronounce "AA" as in "aardvark" and "GH" like the "s" in "measure." When an "A" or "E" precedes another vowel, I usually pronounce the first vowel like a "Y." 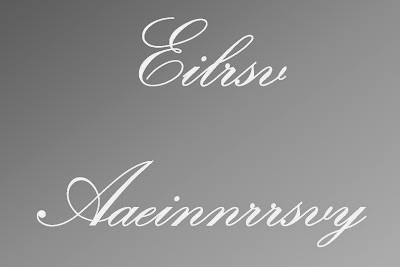 When I can count the repetitions of a letter, I usually try to pronounce them all. For example, in the Tonight Show clip you will hear me pronounce "PROPOSITION" --> "IINOOOPPRST" with three O's. I treat this as a double OO (as in "spooky") followed by a single O (as in "hot") --> "IINOO-OPRST". In a crazy word like "REFRIGERATOR" --> "AEEFGIORRRRT," I only bother pronouncing one "R."
3) When an English word is contracted or abbreviated, should we alphabetize the contracted word(s) or contract the alphabetized word(s)? I decided to contract the alphabetized words. "How Do You Doooo That?!" When people learn of this skill, they usually want to know "how" I do it. Disappointingly, I have never had a satisfactory answer, because this is mostly a subconscious procedure. While writing this anniversary post, I have tried analyzing the skill further for more interesting clues about what might be going on down there in the unlit chambers of my mind. It isn't quite this visual in my mind. It is more accurate to say that I am "aware" of the letters' positions. While I can fairly easily "see" the alphabetized letters in a word, I don't have to. I certainly never visualize the whole alphabet. But I think that the alphabet is in my mind as a template guiding where the letters go. Another way of comparing numbers is "cardinal," or conceiving of them as abstract quantities of discrete objects. We understand that "4" really means |||| "like the legs on a dog" and "7" means ||||||| "like the days in a week." For further reinforcement, we can even outright memorize the less-than relationships between all pairs of numbers, such as 1 < 3 and 5 < 8. There are 45 such pairs. Eventually, we probably come to memorize all of them just by using them so often. For numbers larger than 9, of course we don't need to memorize anything more because we just use the place-value system instead. The alphabet has similarities but some key differences. Most crucially, letters don't represent quantities. They have to be compared in a strictly ordinal way, with no cardinal clues. That's all the more difficult because there are more letters than digits. There are 26 positions on the scale. It's hard to visualize the difference between 8th and 9th out of 26. There are 325 pairs (such as e < n or w < y) -- too many to easily memorize. These must be the challenges making it much harder for people to put letters in order. Apparently, I have a strong sense of these relative positions. I suppose I would call myself very "letter aware." I am a good speller, and I score well on exams that test short-term memory. These skills are also vital. I need to know what the letters are before I can put them in order, and I think it requires a fair amount of "RAM" short-term memory to hold on to the letters and manipulate them. 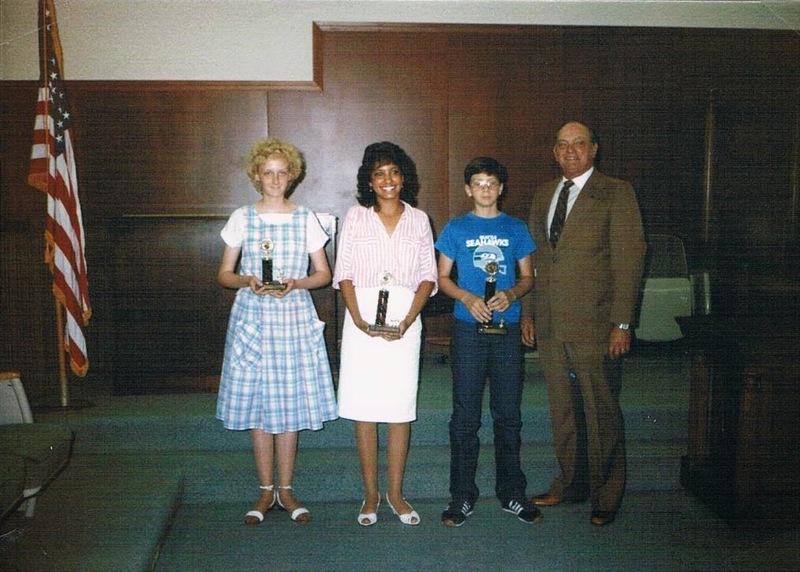 1st place in a 1985 Spelling Bee (age 13). I never forget the spelling of a word I see in print; the spoken word triggers the correct spelling in a quasi-visual way. This is the necessary first step for alphabetizing. It's also enlightening to consider what I can not do. I am not especially good at counting letters or repetitions. Give me a word like "quintessential" and I can return "aeilnqstu" in a split second. It takes a few seconds of hard concentration for me to include all the repeated letters in "aeeiilnnqssttu." It's much easier for me to do this when I'm reading the word. When I do, I form mental connections between repeated letters like the two e's or the two t's. If you asked me how many letters there are altogether or what is the 6th letter in the word, I would have no idea. Many people think that I spell words backward, but I really don't have a knack for that skill at all. These limitations suggest to me that I mentally characterize each letter by its own alphabetic rank rather than the role it plays in the word. Here's an analogy. Imagine that you teach a class of 26 students with varying heights. Aidan is the shortest and Zachary is the tallest. If I selected seven of those students and had them line up in random order, wouldn't you still be able to sort them from shortest to tallest? Sure, no problem. You'd just have to think of them in terms of their height and ignore the order in which they are currently lined up. I think that's basically what I do with letters. I ignore the way they're lined up in the word (which is why I lose count of repetitions), and associate them instead with their inherent order. This trick has taught me the difference between being well-practiced and being innately gifted. By practicing a skill, you can get "good" or at least better. When you become "excellent," you will be performing some of the skill subconsciously. To be world-class, you most likely had to start very young when your mind was learning how to think -- and there is still some sheer luck involved. As a tripartite example, I consider myself "good" at piano, "excellent" at reading and writing, and "world-class" at alphabetizing. It is crucial that I started reading very young while my brain was still plastic. I grew up learning written English as a first language, with no "translation" required between spoken and written English. I noticed a pretty big difference between the literacy I acquired starting at age two and my classmates who started at age six. Yet of all the literary skills to choose from, I only became freakishly gifted at this one random alphabetizing skill. I got lucky with that skill, as opposed to something useful like total recall of words or the ability to write bestselling novels. I also learned piano as a child, but only in my 2nd decade. Though I practiced diligently and became fairly capable, it was already too late to become a standout. A genius like Mozart was singularly talented at piano (and composing) not just because he practiced hard, but because he started so young that his mind was programmed with the language of music. Many musicians start very young too, but most of them just don't get as lucky as Mozart. He could write a phrase of four-part harmony as easily as I could alphabetize a sentence. These skills are subconscious, automatic, effortless. I understand the difference between that and, say, mentally multiplying big numbers. That requires deliberate concentration, and I'm still slow and error-prone. The subconscious seems to be the most adroit layer of the mind, just as it is the most honest. When I made up this language as a kid, I was excited to entertain / show off a little bit with it. You know how much children like to overdo things; I'm sure I did too. I remember performing the trick at many family events, though I can't recall if I did it at school. When I was an insecure kid who cared about such things, I actually do remember wondering if I could get onto a TV show like "That's Incredible." As I got a little older and more accomplished in meaningful ways, I didn't find it so important anymore. In the summer of 1989, I had just graduated from high school. I attended two summer camps, one of which was the National Youth Science Camp (NYSC) in West Virginia. The NYSC is a three-week camp for 100 graduating seniors, two from each state. It still remains one of the most memorable social experiences of my life. 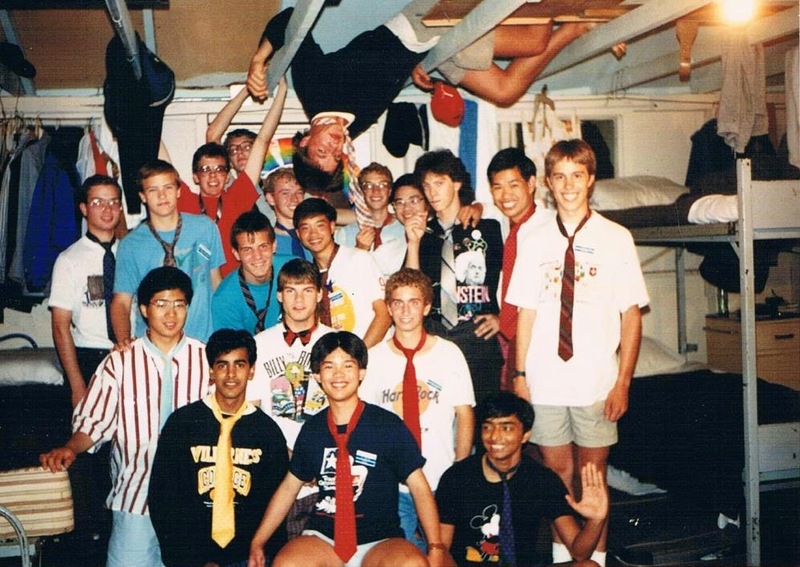 At camp, we had a number of talent shows. I played piano in two of them and joined a whistling choir for another one. For one particular campfire event, I decided on a whim to try out my alphabetizing talent. I seem to remember that I had some people feed me sentences, and I alphabetized other people's names. It was the right crowd for the occasion. My fellow NYSC'ers went wild! The Tonight Show was my third alphabetizing "performance" in 1989. I cut my teeth at the National Youth Science Camp that July, four months before appearing on TV. This was boys' cabin # 6. Just a month or two later, in September, I started college at Caltech. Before school started, new students were oriented at "frosh camp," a three-day event on Catalina Island. Once again, there was a talent show. I considered playing piano again, but after Julian Chen lit fireworks with a Prokofiev sonata, I preferred not to follow that act! So alphabetizing it was. I did a routine very similar to what I'd done at the NYSC. I remember people handing me their name tags, and I alphabetized those. Again, it got a really spirited response. Well, that was that, I thought. Time to focus on school. The following month, I got a surprise call from a guy named Bob Finn, a Caltech science writer who worked in Public Relations. He told me that he'd been looking for a student that he might be able to put on TV to help publicize the school. He had seen me at frosh camp, and said that this would make a perfect pitch for the Tonight Show or Late Night! He asked me which one I'd prefer. Moments like that are surreal. Can you imagine getting an unexpected call one day from someone asking if you'd prefer to be on Carson or Letterman? Neither could I. I am a big fan of both, but I chose Carson because his act was even more classic -- not to mention that it was much closer to school. I have contacted Bob again recently. He and I have differing memories about the audition process. I had it in my mind that he had recorded my frosh camp skit on videotape, and had impressed Tonight Show staff with it. He doesn't remember a video. In any event, he reached out to them and explained what I could do. The next few weeks were a whirlwind. The Tonight Show staff asked me to come to NBC Studios for an in-person interview. The casting gatekeeper, Stephanie Ross, was quite a character, a gal with red sneakers and spiked hair who apparently went on to become a major Tonight Show producer in the Jay Leno era. Well, I passed the audition. Stephanie called back shortly to say that they'd be glad to have me. We set a November date. Public Relations spread the word to newspapers, who started calling me for interviews. I was asked to wear a Caltech shirt on the air. The Rapid City Journal (SD, where I went to high school) was the first paper to break the news, two days before the show. I was on the front page. 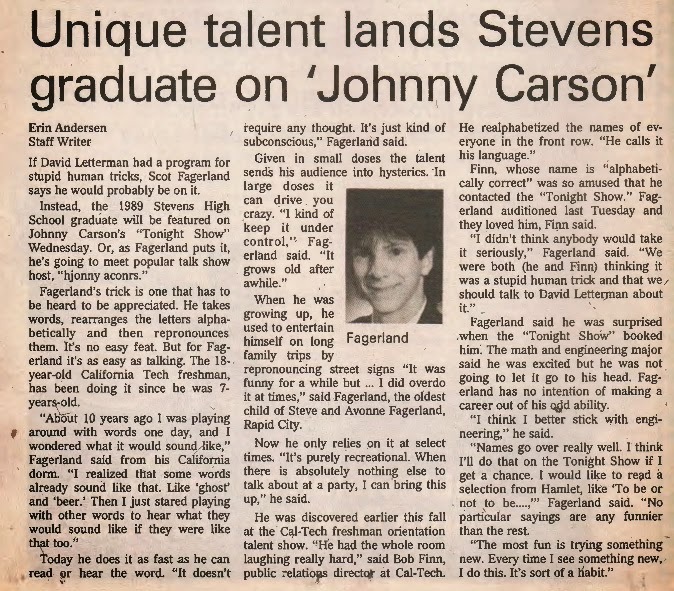 The reporter tried to alphabetize Johnny Carson's name but didn't quite get it right. Ah well, it's the thought that counts.